Sean Dyche has assured Cardiff City his side won’t be taking their foot off the gas, despite going into Saturday’s game at Turf Moor with an eight-point cushion. Two weeks ago, the clash looked set to be hugely significant in the battle for survival, but Burnley have since picked up two vital wins, with the Bluebirds beaten by Chelsea and Manchester City. 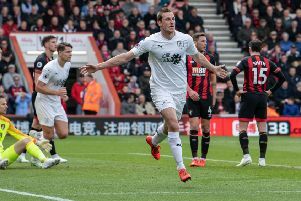 The Clarets have climbed to 14th as a result, clear of the drop zone, and know a win tomorrow would effectively seal a fourth-successive season in the Premier League. However, defeat to Neil Warnock’s side would then leave Cardiff five adrift, with a game in hand to come on Tuesday night at Brighton - who are also in the mix at the wrong end of the table, three points worse off than Burnley. Dyche knows there is still work to be done, despite taking 24 points from 14 games over the second half of the season so far: “I think it just makes us hungry. We have performed again on Saturday, won a game and got three more points. Dyche wants to finish the season with as many points as possible and as high up the table as they can: “Every manager is hungry for everything they can get. “If you had told me at 19 games when we had 12 points, that come now we would be two points behind Bournemouth and have taken 24 points, then I would have taken it. “And even me who believes in what we do would have said that is a pretty big stretch, but the players continue to do it. “We have more work to do, but the players are in a good place. “The important thing is we stay focused on the job in hand, which we’ve done very, very well since Christmas onwards - not terribly before Christmas, things went against us, but we’ve stayed true to the focus on the next game, so that’s the diligence we’ve shown, and we’ve got to continue doing that. Burnley have a testing end to the season as they face Chelsea, Manchester City, Everton and Arsenal, so it was important to get points on the board in advance. But Dyche won’t rest until the final whistle on the final day: “I would have taken it at halfway, you would have taken those points. “You’re never out of trouble until the last day, if you’re having one of those seasons where it’s a challenge. “When the whistle blows in the last game and you know, we have to keep being diligent with what we’re doing, and the players showed that again at Bournemouth. “The focus for me is to keep delivering performances, that’s the message from me. Ribble Valley Elections 2019: Who is standing in your ward?